It’s a busy day at Anita’s small fish stall at Sakrisøy in Lofoten. Her son Carl Fredrik has just pulled up hundreds of hooks with today’s catch out on the fjord and is hurrying back to supply the fish counter with newly pulled halibut and pollock. As soon as he returns, Anita and her husband quickly start gutting and preparing the catch. “The road from the fish being alive and sprawling in the ocean till it reaches the counter is very short indeed”, says the owner Anita Gylseth. “We are a family business and very concerned with having fresh and strictly local fish every day”. In the summer, Anita’s counter bulges with fresh temptations from the sea. If you find your local sushi bar to be raw and fresh, you have yet to try the menu of the Arctic and the Norwegian Sea. 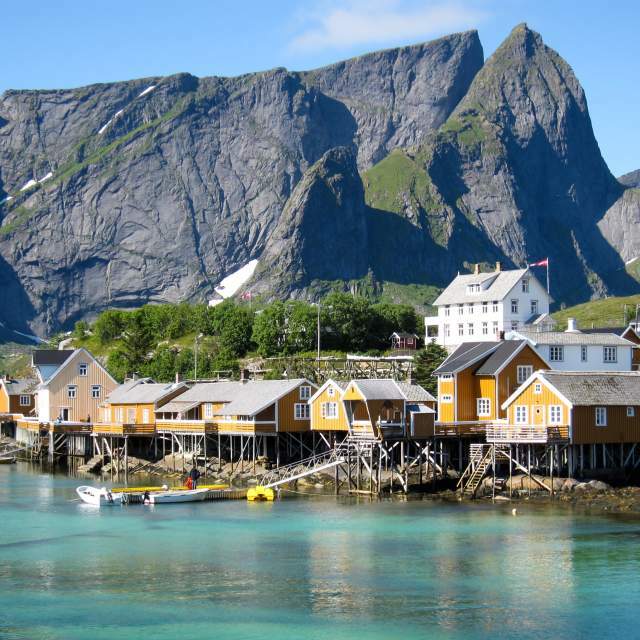 There’s a reason why Northern Norway has provided fish to the coast of Europe for centuries: These seas are the world’s richest, as this is where the cold and warm ocean currents meet. The lower water temperatures allow fish, mussels and shellfish to grow more slowly, which makes the flesh much more tender and fresh up here than anywhere else in the world. Besides, the locals are filled with respect for the long lines in the history of northern fishing. They know what they are doing. They have done it for generations. 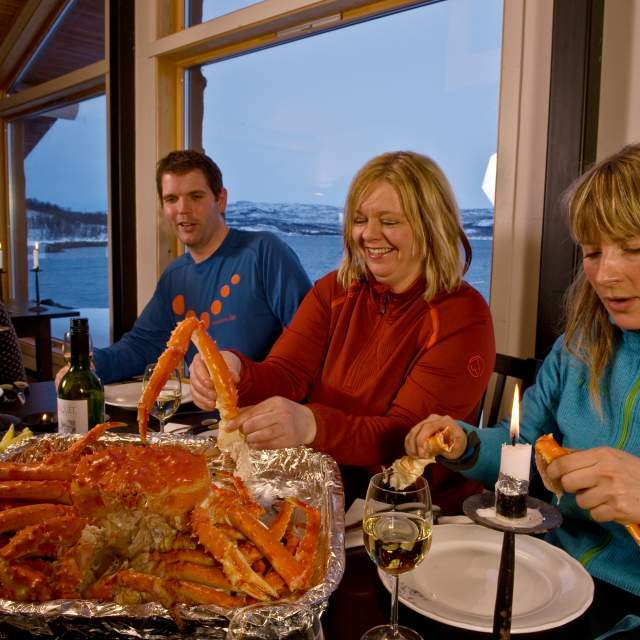 If you’re craving something bigger than mussels or shrimp, the giant-sized king crab can be found in the frigid waters of the Barents Sea just outside the town of Kirkenes.
. Just make sure to watch your body parts. A red king crab can get up to two meters from claw to claw, and can easily chop off your finger if it gets in the way. So you might prefer to let the experienced fishermen manage the creature for you.
. Just make sure to watch your body parts. A red king crab can get up to seven feet from claw to claw, and can easily chop off your finger if it gets in the way. So you might prefer to let the experienced fishermen manage the creature for you. All you have to do is lean back and listen to an old fishing tale or two whilst the crab is brought up from the deep. As soon as the crab reaches the surface, it gets prepared and cooked right in front of you. It’s almost needless to say that the meal that follows is in a league of its own. An absolute feast awaits. And don’t worry – you won’t have to drool over the pot for too long. There is no need to wait until you’re here to find out where you’d like to fish. Filter your search and check out the offers below.